Being pregnant is one of the most exciting times in your life – a new little person will soon be coming to live with you! Here, we have prepared a Review of the 5 Top Rated Maternity Pillows, narrowing down your choices to the best of the best. Whether you are in your first trimester or your third trimester, getting a comfortable body pillow will not only help you get restorative rest, it can double as a nursing pillow once your bundle of joy arrives! Are you Ready? Continue reading to learn more about the 5 best pregnancy pillows and find one that will best suit your needs. Which one is the ideal pregnancy pillow? 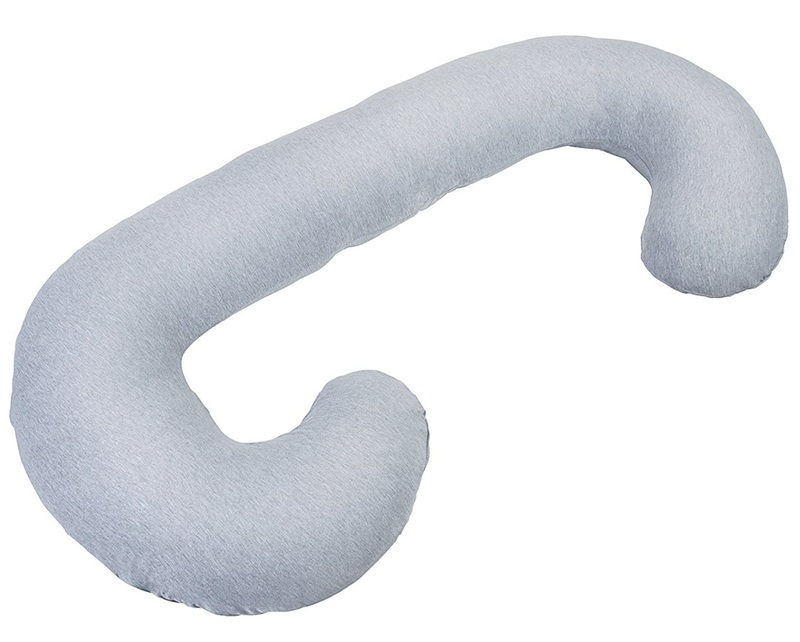 PharMeDoc C-Shaped Full Body Pregnancy Pillow provides the proper support for head, neck, back, hips & knees, providing you a pillowy comfort that is perfect for laying on your back, sitting up or laying on your side. 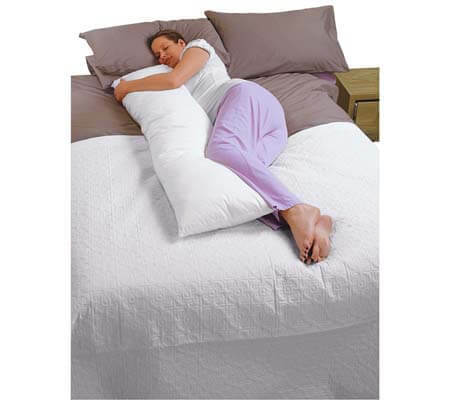 With this adjustable body pillow, you can toss the extra pillows and get the best heavenly sleep. We made sure to include this in our Review of the 5 Top Rated Maternity Pillows. The PharMeDoc C-Shaped Full Body Pregnancy Pillow is consistently rated among the best pregnancy pillows and receives a 4-5 star rating 75% of the time. While the cover may be somewhat lacking in workmanship, it more than makes up in comfort. This pillow is probably best-suited for women who don’t toss & turn and like the feel of cotton. Also, you can purchase C-Pillow covers for approximately $20, helping to preserve the factory cover and extend the pillow’s life. Support it delivers, regardless of the position you chose. It is so big and heavy and not designed for petite women. Just like it’s sister pillow, the PharMeDoc C-Shaped Full Body Pregnancy, is also at the top of the list as one of the best pregnancy pillows, providing great support for you and your baby bump. Just snuggle in – this pillow will snuggle you back, providing support to every part of your body.The 100% knit jersey pillow cover will move with you. And don’t forget you can et C-pillow covers for approximately $20. This pillow is just different enough to be included in the Review of the 5 Review the 5 Top Rated Maternity Pillows. 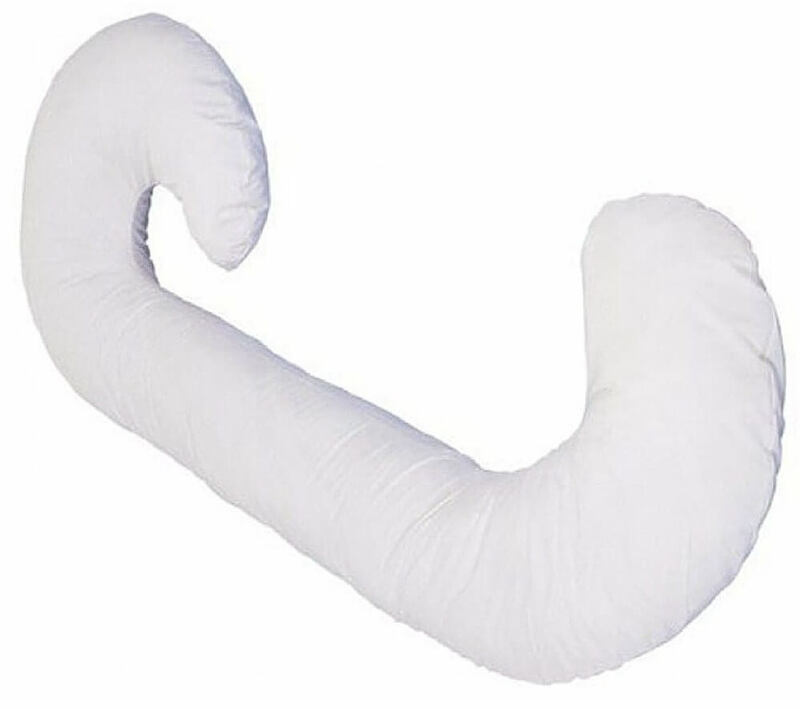 If you’re suffering from head, neck, hip or leg pains associated with pregnancy and missing out on quality sleep, then it’s time to look into getting a body pillow, such as the PharMeDoc C-Shaped Full Body Pregnancy Jersey Pillow to help you get the quality of sleep you need and deserve. The jersey cover itself – it stretches as you turn, preventing it from tearing. Jersey may sleep a little warm for some women. 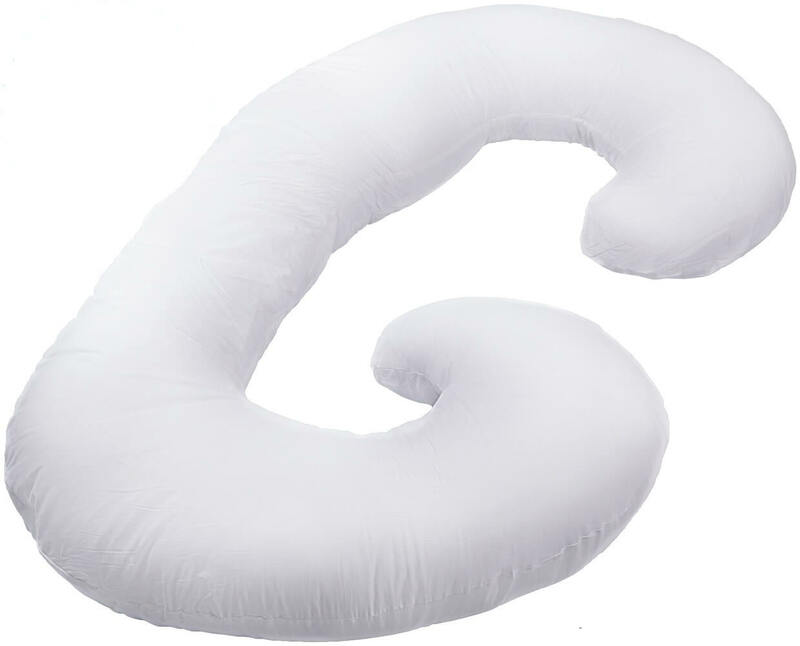 You may need to purchase the PharMeDoc C-Shaped Full Body Pregnancy Pillow with the 100% cotton cover. 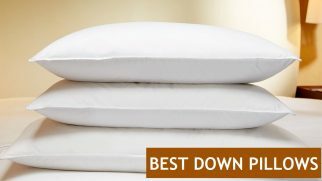 This pillow is one of the highest rated U-shaped pillows, receiving as 4-5 star rating by 82% of those who have purchased it – we just had to include it in our Review of the 5 Review the 5 Top Rated Maternity Pillows. This pillow offers lots of support due to its oversizing, providing just the right amount of support in all the right places. It is quite large, taking up ½ of a Queen-sized bed – but sleep is precious! This is one of the best pregnancy pillows available. This pillow is multipurpose in that it has also received high ratings from people who have ordered it to use during their recovery from surgery. Although it may “over-snuggle” you, this pillow is one of the best. One of the best features is its sheer size. Although it’s not very long, you can sleep peacefully on your back or side all night long without moving (except for when nature calls). One of the least desirable features is its sheer size. If you are of small stature, chances are that one of the “arms” will fall off the bed if not positioned properly – you probably don’t weigh enough to hold it in place. Also, moving it to remove the cover for laundering can be quite a task. This pillow is not only one of the top rated maternity pillows (95% of buyers rate it at 4.5-5 stars) it may be the ONLY pillow you need throughout your entire pregnancy and beyond. Forget about all those other pillows – this one replaces them all, providing the proper support for your head, shoulders, back and tummy all at the same time. Don’t be fooled by the low cost of this pillow! As stated, this pillow is at the top of my Review of the 5 of the Top Rated Maternity Pillows due to its 95% favorable ratings. Additionally, the space-saving benefits is an added plus! All its features make this one of the best pregnancy pillows. One of the best features of the Restorology Full 60-Inch Body Pregnancy Pillow is that it frees up lots of space on your bed with its sleek design and you can get rid of those other 4-5 pillows! One of the least desirable features of the Restorology Full 60-Inch Body Pregnancy Pillow is its length. At 60”, some moms-to-be may find it a little too large and that it “swallows” them up, making it difficult to turn or disengage from it. This uniquely C-shaped pregnancy does it all! Following the natural contours of your body, it provides the perfect amount of support from head to your knees, elevating your legs to minimize leg swelling. With its 93% rating in the 4.5-5 star category, it made our Review of the 5 of the Top Rated Maternity Pillows. With an overall 93% approval rating, the only negative aspect of the SUPERDADY Full Body Pregnancy Pillow,Baby Nursing Cushion is its sheer size. 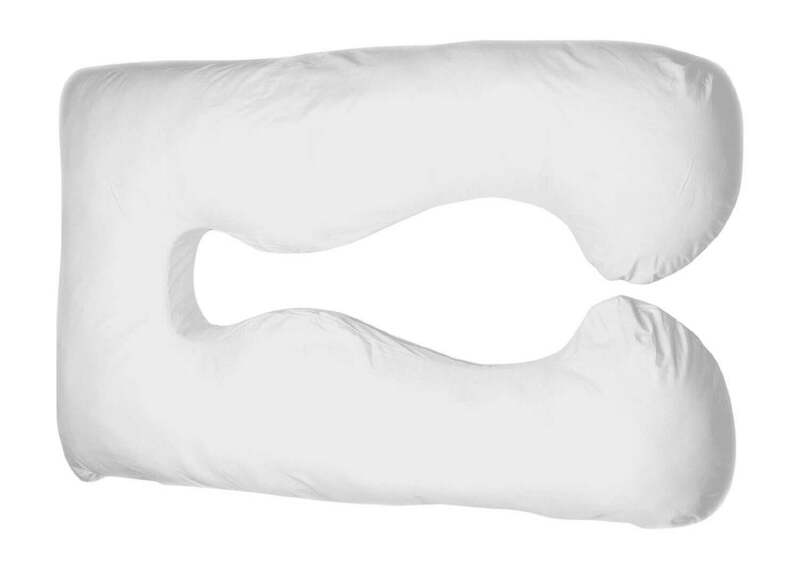 In reviewing this top rated maternity pillow, some people claim it never “fluffed out” to the full 7” loft. One of the best features is its 63” length, making it very accommodating for taller women. It’s the ideal full-body support pregnancy pillow, providing excellent support for your baby bump, back, knees, hips and head. The least desirable feature is its 63” as it will “swallow up” more petite women, causing them to sleep “hot”. While some may enjoy this type of “swaddling”, it can be cumbersome. Shape and size. Different types of pillows are designed for different sleeping positions. We choose the ones that can give maximum comfort to women in the family way, regardless of how far in their pregnancy they are, be it four months or eight months. Firmness. During pregnancy, women need more support for their body during the sleep. That’s why a firmer pillow than one is used to is advised. We recommend items that can offer a balanced feel, the ones that won’t make you feel you’re surrounded by stones or sinking in quicksand. Noise. Some pillows make crinkling and rustling sounds when you move because of the nature of the materials inside. It can get really annoying, especially if you’re a light sleeper. We test items for noise and offer only the ones that won’t wake you up in the middle of the night. Versatility. Some pillows, apart from being useful during pregnancy, can also serve other purposes when this period is over. For example, they can be used as a snuggle or a nursing pillow. So, versatility is always a plus. Rating. It’s important to consider other women’s experience using this or that pillow. That’s what we always do before actually listing an item here. Although the term “comfort” differs from person to person, we’re willing to offer you only top-rated pregnancy pillows that are universally comfortable. More than 50% of women report having lower back pain during pregnancy. Getting a pillow that supports all parts of your body properly and helps you relax during the night is a great idea. The shape is the primary factor that defines whether your pregnancy pillow will feel comfortable or not. So, here’s an overview of three main types of pillows based on their shape. This type of pillows is very comfortable to cuddle at night. Being rather long, they can have either a straight shape or be moldable and bendable. 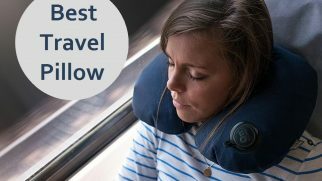 Whichever you choose is up to you, but with either of them, you can do without a head pillow, which is a plus. You might not get enough support for your spine because full-length pillows are placed in front of you. Thus, if you’re a stomach sleeper or tend to toss and turn during sleep, chances are you will have proper support when falling asleep but you will lose it once you turn to your side or try to lie on your stomach. Overall, women who are used to hugging something at night will benefit from using this type of pillow the most. These can be shaped like the letter “C” or “U”. They are usually quite big so that you could comfortably nestle inside, and they give proper support to both your front and back. Total body pillows, apart from doing their main function, can also supplement for both a head pillow and a knee pillow. U-shaped pillows are more comfortable due to their symmetric design. They allow you to switch from lying on one side to lying on another quite easily. Note, though, that pillows of this type are rather bulky and more expensive than other options. Wedge pillows are used as support pillows either under your tummy or behind your back. They are quite small compared to other pregnancy pillow types, and they require you to use a regular head pillow and a knee pillow (if you need one). When put under your stomach while you’re sleeping on your side, such a pillow will relieve some pressure and support your tummy. When put behind your back, it will prevent you from changing your sleeping position so that you could comfortably rest on your side. The best things about wedge pillows are their affordability and functionality. They are cheaper than other options and they can be used in so many different ways, even after you give birth. Your partner will totally love the size, as he won’t have to sleep on a different bed anymore just because your pillows take up the whole sleeping surface. But the tricky thing is it might be rather hard to find a suitable wedge pillow personally for you. That’s because they differ a lot in slope and firmness. Polyester. Pillows made from this material are soft and quiet but might sleep hot. Memory foam. These can be made from a solid block of foam or from shredded pieces. The latter option offers better airflow. Whatever the filling, memory foam pillows are quite supportive and retain their shape very well. Beads. Although they might lack some responsiveness, microbeads are quiet, lightweight, and quite supportive. Styrofoam balls. This type of filling is cheaper, moldable, and lightweight. However, such pillows can get quite noisy when you toss in your sleep. Natural materials. Most popular options include wool, kapok, wheat, and cotton. Each of them has some pros and cons, but they are all eco-friendly. You decide! Your comfort is paramount – but you need to consider some additional factors. Amazon’s Choice is the Restorology Full 60-Inch Body Pregnancy Pillow. While that is an excellent choice, the SUPERDADY Full Body Pregnancy Pillow appears to be very competitive and provides the extra loft and length that accommodates more people, making it the #1 choice of this review. Remember, the first pillow you try may not be “the one” ; try 2 or 3 then decide. Hopefully, this Review of the 5 Top Rated Maternity Pillows has provided useful information to help you make an informed decision. Simplify: look for ease of care, i.e. is it machine washable/dryable? Satisfaction Guarantee: Before you order, check the satisfaction warranty and return policy in event you don’t like it. If you don’t like it – Return it immediately as it won’t change over time. Do you agree that pregnant women require special pillows for a more comfortable sleep? Which one do you think would be the perfect option for you? Let us know in the comments! Am newly married and the hope of conception is there. What can you say about PharMeDoc, my husband instructed me to inquire. We need to know it’s tensile strength and capacity in order to make a complete purchase. I have a problematic pregnant wife, and she always complain of this body pains, leg and neck. I need to get her a quality pillow to assist her out of that condition. I will go for Queen Rose pregnancy pillow to snuggle her body thoroughly.